Did you hear that ruckus? Don’t mind that cha-ching jingle, it was just the sound of the UFC juicing the cash register after announcing their hectic plans for 2014. 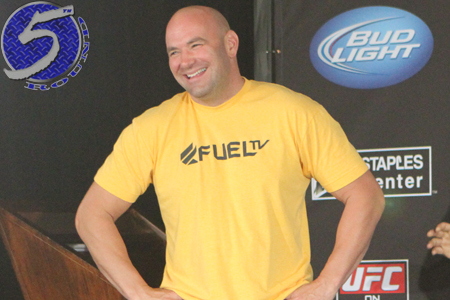 During Wednesday night’s edition of “FOX Sports 1,” UFC president Dana White (pictured) said the planet’s premier mixed martial arts promotion will host at least 35 events next year, a record number of shows in a single calendar year for the organization. There will be 14 cards on FOX Sports 1, 13 via pay-per-view and four apiece on the FOX and FOX Sports 2. The UFC is holding 33 events this year, one more than they did in 2012. White also announced UFC on FOX 10 will be held at Chicago’s United Center on January 25, confirmed UFC 169 takes place February 1 in Newark, NJ (Super Bowl Saturday) and UFC 170 goes down February 22 inside Mandalay Bay Events Center in Las Vegas. No fights were announced for any of the cards.